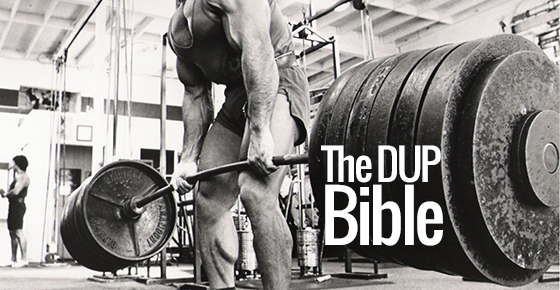 DUP, or Daily Undulating Periodization, is the new cool kid on the lifting block. It also flies in the face of everything you thought you knew about lifting. For decades upon decades, lifters have been worried about over-training. Men of muscle and might, who can bench press small bears and lift up cars, virtually mess themselves at the thought of training a muscle group more than once a week. So why is squatting, deadlifting, and benching, two to four times per week now making headway in the world of powerlifting and bodybuilding? You make your way to the gym, ready to train with your buddy, squat shoes in hand and start heading over to the rack, only to have him lay this on you. Exasperated, you ask him what he’s got on the cards – chest. Nope, that doesn’t work for you since you did 32 sets for your pecs just two days ago. Training them again so soon would be over-training. The muscle fibers aren’t fully recovered, so more damage would be no good whatsoever and you’d lose your gains. There are a number of reasons why. actually, hitting a muscle more frequently is far more beneficial than only working it once a week. First up, we have muscle protein synthesis. 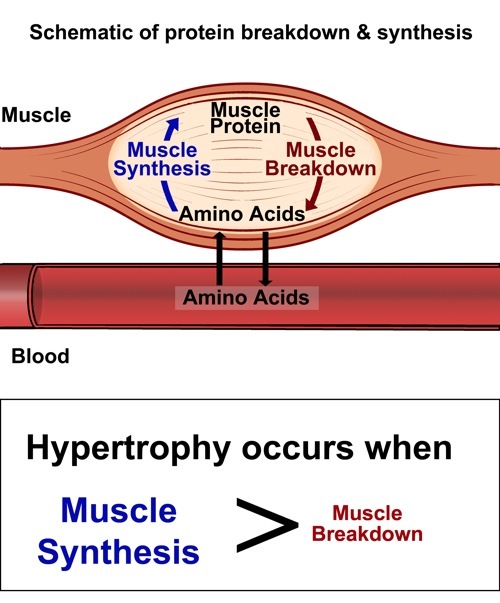 Muscle protein synthesis (or MPS) refers to the uptake of protein, growth, and the rebuilding phase in muscle cells. To get bigger and get stronger, you want frequent peaks of MPS. MPS is not the only factor needed for growth, but it is a key driver in hypertrophy. This means that by waiting so long between training muscle groups, you’re leaving a hell of a lot of MPS elevation potential on the table. By leaving up to seven days from one training session to the next, MPS is sitting at its normal, not particularly anabolic level for almost six whole days. Maximizing MPS is the key to muscle growth. Photo courtesy of Precision Nutrition. To squat a lot, you must squat a lot. If you’re familiar with the work of kettlebell guru Pavel Tsatsouline, you’ll know that one of his big ideas is that to get proficient in an exercise, you must train it frequently. This is known as “greasing the groove”, and is often applied to bodyweight exercises, such as push-ups, pull-ups, and single-leg squats. The premise is that you perform your chosen exercise(s) frequently, but never work to the point of exhaustion. Let us say that you’ve been stuck on 10 pull-ups for what seems like an age. Take half your maximum reps (in this case, that’d be 5) and perform this many reps at least three or four times per day, perhaps taking one day off completely each week. After four weeks or so, you’d test your max, and I’d bet my mortgage that your max will have increased. Increased frequency and increased total volume without causing extreme fatigue on the muscles. This is a slightly different method to DUP, but the principle is exactly the same. Any sane person would answer “HELL NO!” because the idea of trying to improve something by doing it infrequently just goes against all basic human logic. One last potential benefit of an increased training frequency, from a purely anecdotal standpoint, can be seen by looking back at some of the strongest guys in recent years. The Eastern Europeans were, by far, the best weightlifters in the world in the 1950s and 1960s. While their alleged increased advances in “assistance” no doubt attributed to this, they were also proponents of high-frequency training – squatting, pulling, snatching, cleaning and pressing six or seven days per week, and up to three times per day. It didn’t seem to affect their numbers. Likewise, the bodybuilders from the glory days of Venice Beach in the 1960s and 70s didn’t train on the once-a-week body part splits that most IFBB pros utilise now. The most popular bodybuilders in the 1960’s and 1970’s in Venice Beach trained each body part more than once per week. Okay, you got me. None of the above actually told you what DUP is, but I like to keep the intrigue going as long as possible. What it hopefully did, however, was show that just because most bodybuilders only hit a muscle group once a week, that doesn’t make it the only way. It does not even make it the optimal way to train. Likewise, higher frequency training could potentially have even more benefit. And this is where DUP comes in…..
What the Hell is DUP? DUP is essentially high-frequency training. You hit a muscle group or perform a lift three, or possibly even four or five times per week. Undulating – This refers to the fact the weight/intensity/load changes on a session by session basis. Periodization – The program is set up in such a way that it is progressive, and has periods of light, moderate and heavy work. The key to DUP is getting in maximum workout volume, without impacting recovery, which is why the undulating and periodization aspects are critical. – Only choose one “type” of any one movement per cycle. You don’t want squats, front squats, paused squats and safety bar squats in the same training block – choose just one variation at a time. – Set your week up so you work each exercise in different ranges. These could be classed as “power, hypertrophy, and strength” sessions, or “light, medium, and heavy” – it doesn’t matter what you call them so much, only that you are working at different loads and intensities. – Don’t go nuts on the accessory work. Performing this much weekly volume on a few specific lifts will leave you spent. If you’re trying to hit 20 sets for biceps, looking to increase your pull-ups, or performing eight different types of lateral raise on top you’ll come unstuck. Programming a DUP cycle is surprisingly easy. First up, decide your exercises – I would definitely go with back squats, regular bench presses, and deadlifts in your first time round. This is just to get used to the rhythm and increased volume. Now, we need rep ranges. I like something in the power rep range and intensity spectrum, something in the strength parameters, then some higher rep work as per typical hypertrophy work. Add weight and keep sets and reps the same. Keep the weight the same, but add sets and reps, while sticking in the given ranges. Going with the above template, and using the bench press as an example, here’s how a 4-week cycle might look. We’ll use a 1RM of 250 lbs. Accessory work should be tough, and focus on areas that the big lifts don’t hit directly. Ideally, it won’t have any negative impact on your strength for the main sessions. This is why keeping everything at around an 8 to 9 out of 10 in terms of intensity, and not pushing to failure is recommended. There’s a “done-for-you” accessory session coming below. Follow that structure, add the weekly progressions, and I guarantee you’ll see your fastest gains since you left newbie status. Enter your name and email to see the free video on DUP. It really is no surprise that pro bodybuilders and powerlifters, such as Layne Norton, Ryan Doris, and Paul Revelia, are well and truly on board the DUP gain train. 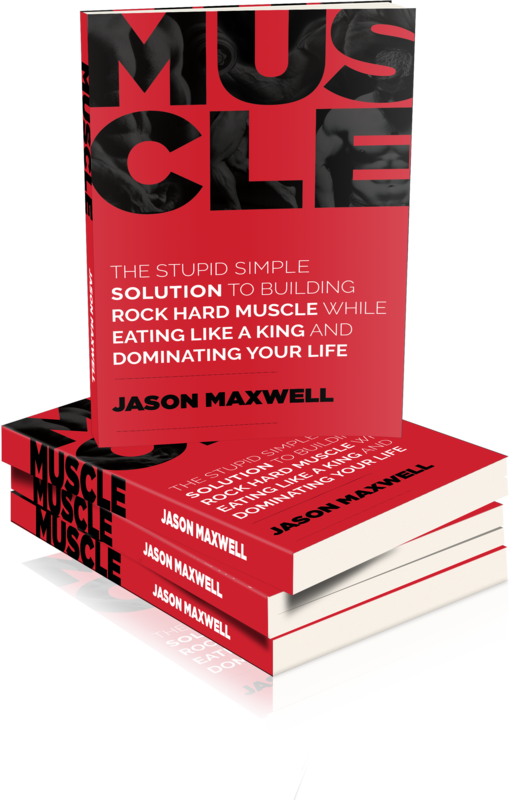 Volume is, by far, the most underrated aspect in any size and strength building program. It is also quite often overlooked in your typical bodybuilding routines. If this hasn’t been enough to get off your once-a-week split routine, I don’t know what will be. Mike Samuels is an online coach and personal trainer based in the UK, specialising in fat loss and strength performance. As a competitive powerlifter and former fat boy, Mike knows what it takes to get lean while gaining. For the ultimate DUP program, completely set up and tailored to your current lifts, check out The DUP Method. “TESTOSTERONE NATION | Figure Athletes.” TESTOSTERONE NATION | Figure Athletes. Web. 16 Sept. 2014. <http://www.t-nation.com/free_online_article/most_recent/high_frequency_vs_low_frequency&cr>.